First off, thanks to the Milwaukee Brewers for this opportunity. We are very excited to begin this journey together. Big thanks to all the players for their effort and for the support of their parents. Though from all over Canada and a few from Phoenix, the Brewers created friendships and team chemistry in a matter of days! Players flew in early Wednesday and were able to workout that night! The one day of rain a year in Phoenix was that Tuesday, so fields were off-limits. But, the BLE has a friend at Extra Innings Indoor Facility in Mesa so we headed east! 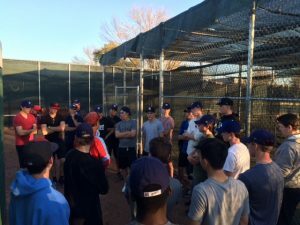 Multiple local colleges were planning on attending outdoor practice but Mesa CC was still able to attend Extra Innings, speaking to a few of the players. 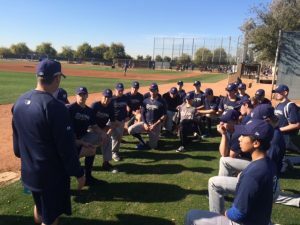 After the workout, players received their Brewers gold and blue shirts and then were privy to an intense pep talk from Shea. He spoke about the importance of being on time as a hitter, the commitment necessary to make it and told an awesome story of hitting a HR at Fenway off of Mariano Rivera. 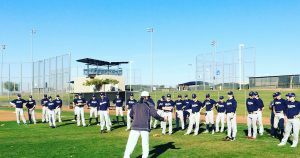 Early Thursday morning, players piled onto the Team Vans and headed to Maryvale Baseball Complex, home of Brewers Spring Training! The players took it all in as they walked through around before setting up at our practice fields. The MBSTC happily received their hats and were looking sharp as began to stretch! What a day for our player’s development! The players had the night off to rest and prepare for the tournament start the following morning. 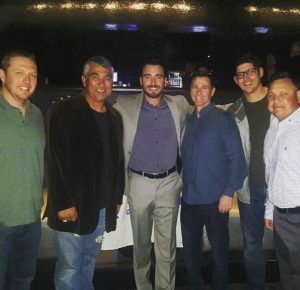 Coaches were invited to Chad Bettis’ Testicular Cancer Society fundraiser at the Talking Stick Resort. Albie supported the cause and won 3 items in the Silent Auction, including a signed Gary Sheffield Brewers rookie card! Lost 6-0 to eventual champions, Sticks Academy (Ark). Faced a strong LHP committed to Louisville. Joel McGrath, Ryan McFarland, Connor Schneider, Brendan Patterson and Melvin Lorenzo threw against the Sticks. Joel McGrath warming up before his start on a beautiful morning! Tied 6-6 vs Stars and Spikes (Calif). Back and forth battle that saw the Brewers leading in the 7th. Dan Gernon had a triple, Gage Brebant and Jackson Hogg with RBI singles. Kyle Gee threw 2 innings, Tyson McInnes and Cam Dunn with 1+ and Ewen Hall finished it off. 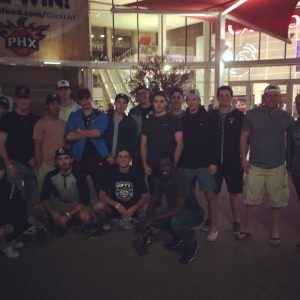 After both games, the players loaded the Team Vans and headed to Mesa Community College for a campus tour and visit with Head Coach Tony Cirelli. Players were able to watch the T-Birds practice as well as ask Tony questions. That night, several of the BrewCrew headed to the Rockets vs Suns NBA game! With an all-you-can-eat voucher and an exciting game, it was an awesome experience! BrewCrew at the Suns game! Lost 7-1 vs Premier Baseball Futures out of Houston, eventual 3rd place finishers. 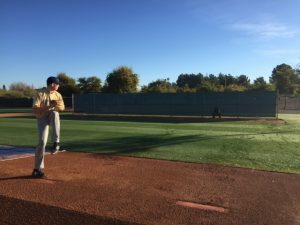 Faced an LSU commit throwing 88-90 but that didn’t stop Liam Thorne from getting a hit. Dylan Edmands hit a double and Jude Hall scored him with a single. Riley Aurora, Garver Pierce and Brodie Comerford threw for the Brewers, with Comerford throwing 3+ strong innings. Justin Breen in the box ready to hit! Tied 5-5 vs Sticks Academy from Arkansas. Facing 10 players with Div 1 commits, the Brewers were down much of the game. 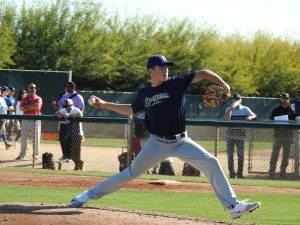 The pitching of Ronin Kopp, Max Poole, Taylor Isaacs and Jacob Chevarria kept the Brewers close. With a late rally, the Brewers took the lead, with Jamal Armstrong stealing home to tie the game! The Sticks rallied in the Top of the 7th, taking the lead. With 2 outs in the 7th, Armstrong and Green worked walks and Daniel Gernon tied the game with a single! Heading into their next two games, the Brewers would need to win both to have a chance for the playoff round. After the games on Saturday, players and coaches headed to the Westgate Entertainment District for dinner and to watch football! At Dave and Buster’s, coaches Joe and Kyle squared off against the players in basketball shooting comps. With both teams looking for their first wins, players woke up hungry! Facing the Placer Pilots, Ryan McFarland, Jamal Armstrong and Matt Dobberthien held the opposition to only 3 runs. Ty Hall had two hits, Ayden Makarus 4 walks and Justin Breen 2 RBIs, helping the Brewers score 9 runs! Big win for the BrewCrew! Facing the AZ Future Stars, a rival of Albie and Eddie’s MD BlueJays, the Brewers came out strong, scoring 5 in the first and another run in the second. Cam Dunn threw 2 giving up 1 and Isaacs and McInnes threw 2 and 3 respectively, giving up no runs. 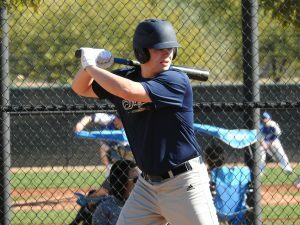 Thomas Green led off the game with a 2B and then added a 3B in the 2nd, with Jackson Hogg scoring him in the first and Jon Klassen scoring him in the 2nd. 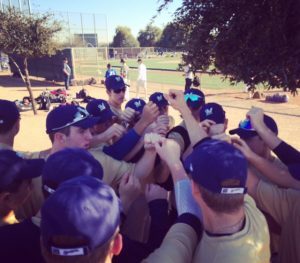 With the 9-3 victory, the Upperclassmen Brewers stayed in the hunt for playoff baseball. Facing the Aggies from New Mexico, the Brewers were looking to finish the tournament at .500. McGrath came out strong, going 2 plus innings before Schneider came in and finished up the 3rd not allowing any runs. Patterson picked up the next 2 with Corbin Smith finishing the game on the hill. Must win situation, facing the Minnesota Blizzard. Jacob Chevarria goes 2 strong, giving up only 1, but the pen gives up 3 in the third. Brewers start slow, but rally for 2 in the 6th with hits from Max Poole and Makarus, only to give it right back in the 7th and lose 6-2. Fortunately, the baseball was not finished! 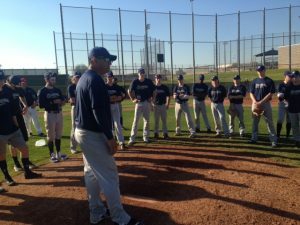 Thanks to Perfect Game and the San Diego Show, we arranged an exhibition game on Monday morning. Sunday night, several players took part in a fun basketball pickup game at a nearby school! Day 6: 1/15 – Final Day! The players woke up bright and early for their last day in Phoenix. We headed to field ready to smell the grass and feel the sun for the last time in a while. 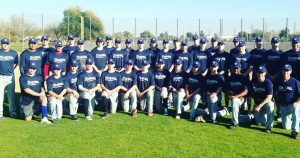 The San Diego Show program has had multiple winners the last fews years in this tournament and brought the heat on the mound. 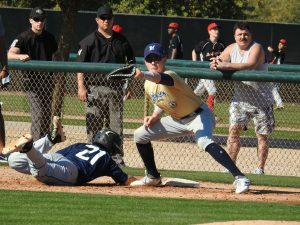 Justin Breen showed off the leather for the BrewCrew, making several nice plays at 3B. The boys scratched out a run late but fell short, 3-1. It was an awesome experience as many of our Underclassmen players were able to play and face the older Show team. Afterwards, Coaches Marty, Albie, Eddie, Joe and Kyle spread their wisdom on the players and thanked them for their effort. There were photo ops a plenty as players made new friends and enjoyed the Scout Team experience together over 6 days of baseball in the sun! Coach Marty giving the wrap-up speech Monday morning – What a trip!